VIDRIO Products Corporation , Chicago, Cat. E60 , Pat.No. 1935857. Electric, Works, Cord needs some work. Clear Measuring Jar in good condition. Knapp Monarch KM from Belleville, ILL. Alternate Current Only printed on side of mixer. Works but will surely need a new cord. Nice Green Jar in very good condition. 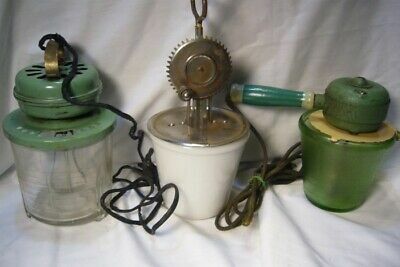 A & J Hand Mixer, some rust spots, with a Hazel Atlas milk glass jar in good condition.